Bluetooth, Air Conditioning, Manual, Cruise Control, Power Door Locks! The 2016 Jeep Wrangler builds faithfully on the reputation and the look of the past, with just enough contemporary features and modern amenities. 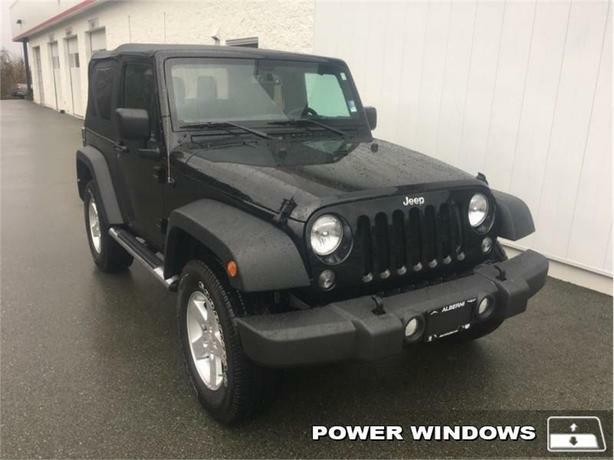 - The Car Connection This 2016 Jeep Wrangler is for sale today in Port Alberni. The 2016 Jeep Wrangler remains the most capable vehicle in the brand's lineup and perhaps the most capable SUV on the market. The flagship Jeep Wrangler is known for amazing off-road capability. Pushing the limits of where you can take a sport utility vehicle, the 2016 Jeep Wrangler is open-air freedom personified. From downtown to the back woods, adventure is yours to discover. The Wrangler is so dependable that it earned the Canadian Black Book - Best Retained Value Award - again in 2015 for the 5th straight year. Built for adventure, the Wrangler's iconic look tell everyone that you're living life to the max. This SUV has 28582 kms. It's black in colour. It has a manual transmission and is powered by a 3.6L V6 24V MPFI DOHC engine. This vehicle also has the following features: Bluetooth, Air Conditioning, Manual, Cruise Control, Power Door Locks, Power Windows, Fog Lights. It has some remaining factory warranty for added peace of mind. Our Wrangler's trim level is Sport. Take the rocky road to freedom without worries, the 2016 Jeep Wrangler Sport has your back. Key features include a 6 speaker audio system with steering wheel audio controls, cruise control, durable cloth seats, front fog lights, electronic stability control and an outside temperature gauge. To view the original window sticker for this vehicle view this http://www.chrysler.com/hostd/windowsticker/getWindowStickerPdf.do?vin=1C4AJWAG6GL174888. Alberni Chrysler is the smart choice for buying a used car. Get the quality, value and peace of mind you need from a company you trust.